If you are desperately trying to find a job and giving applications and interviews all the time, but not getting any kind of results or success, then you can try this simple paranormal home remedy for quickly getting a suitable job, which makes the use of currency coins and the Holy Basil or Tulsi Plant. This Gharelu Uapy is as mentioned above is not only simple and easy to practice but rare and interesting and as per this Tantra, it is effective and beneficial in helping a jobless and unemployed person in getting suitable employment or livelihood fast. 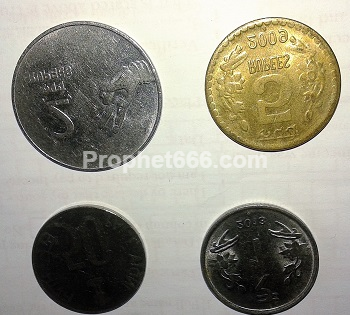 On any Shubh Muhurat or Shubh Tithi or Hindu festival, like Diwali, Navratri, Holi, Makar Sankranti or Dussehra, take the currency coins mentioned below in the same number and denomination. Even though, a 50 Paise Coin is now out of circulation, it can be easily procured from anywhere and used for this remedy. If you are living any other country, then, you can use the coins having a similar denomination of that country. Then, follow the simple procedure given below to perform this Naukri Pane Ka Upay. 1] Bury all these coins in the soil in an earthen pot containing the Tulsi Plant. 2] Worship the Tulsi Plant by offering it Dhoop/ Agarbatti and Diya and offer water and then say a small prayer in your own words stating your wish of getting a suitable job as per your needs. 3] Then, do 11 Parikrama of the Tulsi Plant. 4] Worship the Tulsi Plant in the same manner everyday until you get a suitable job. 5] After you get the job, remove all the coins from the Tulsi Plant and distribute them to small children. If you attempt this remedy and get a job fast, please share your experiences in the comments section so that it might benefit other jobless people who are trying to find a job. Note- Many such simple remedies for getting a job or any kind of employment can be found on the various sections of this site, you can also find them by doing a site search.